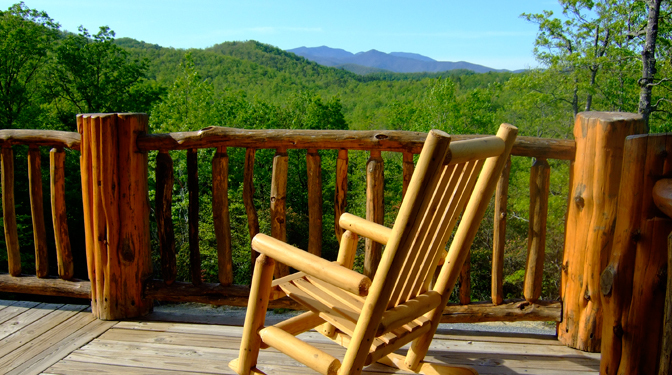 Enjoy an enriching vacation at High Rock Haven, a private residence vacation home nestled high atop 35 acres in Black Mountain, NC. 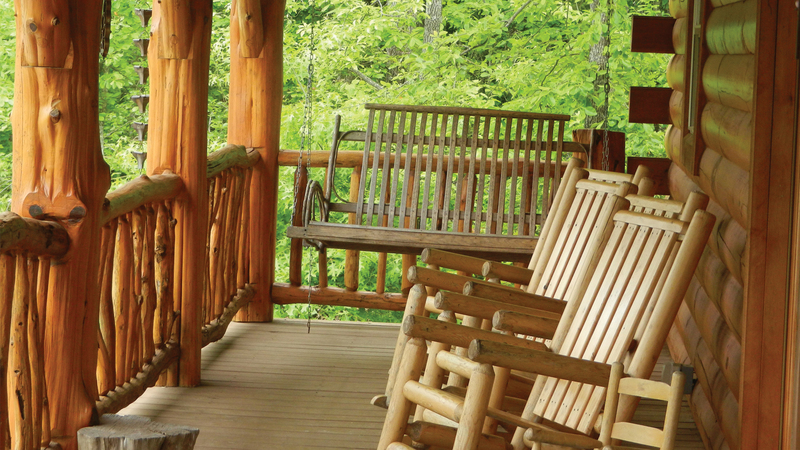 With magnificent views of the Blue Ridge Mountains and natural rustic elegance this beautiful home is the perfect place for a family vacation. 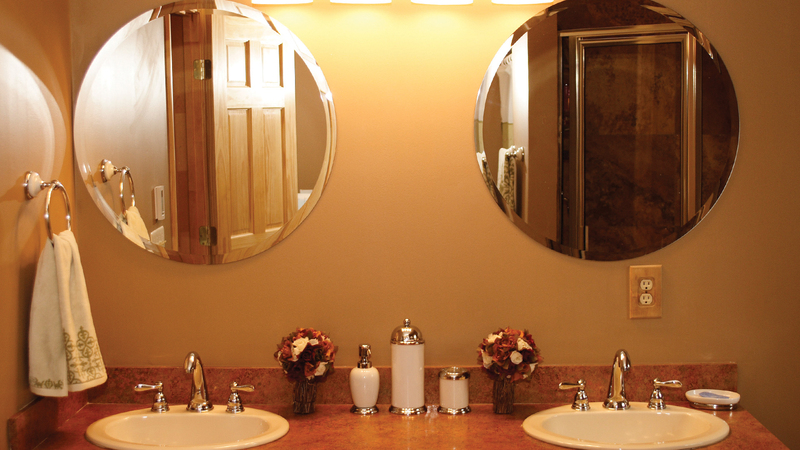 No detail has been overlooked in the planning of the 2,700 plus square foot 4BR/3BA home. Soaring ceilings with rough-hewn log construction. 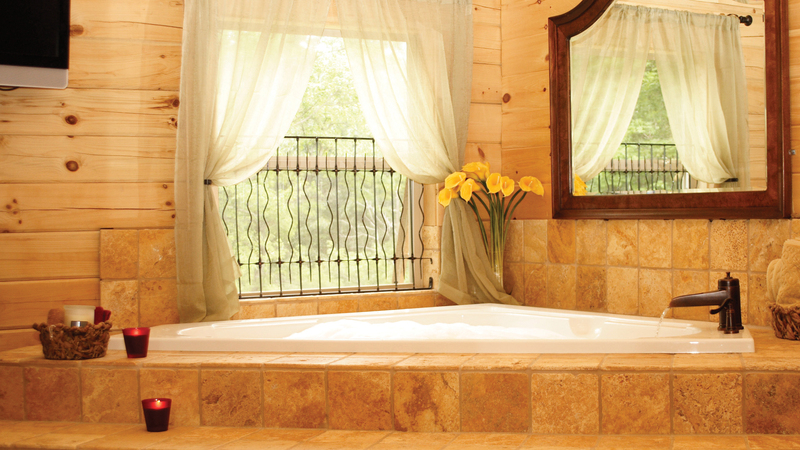 Rich tiles and hardwoods. A grand wood-burning fireplace centered in the spacious great room. 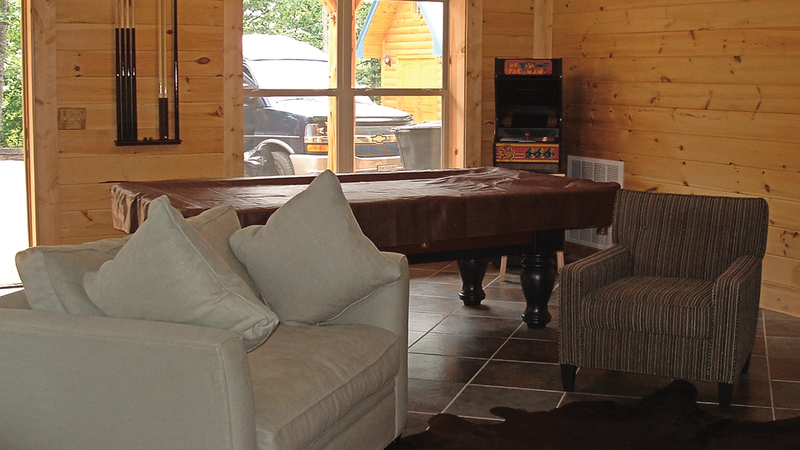 Game room with pool table, video games, 42-in plasma TV, and expansive deck with dramatic views of Mt. Mitchell - the highest peak east of the Mississippi. As beautiful as this home is, it's just a prelude to the many gifts outside your door. 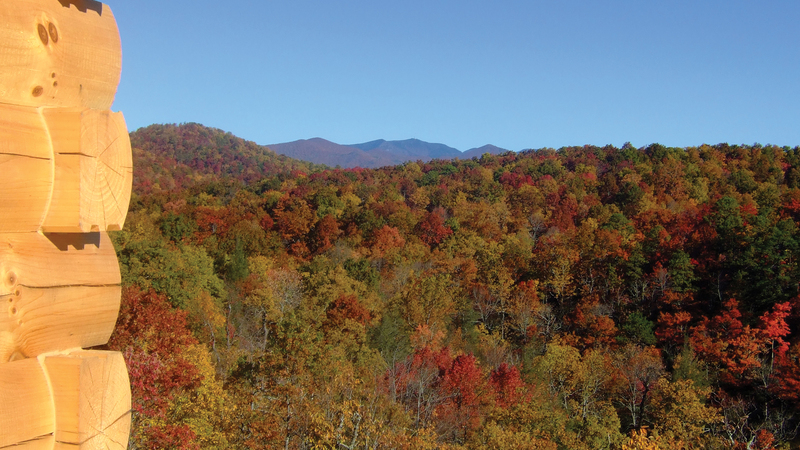 In each and every season, Western N.C. offers the best vacation possibilities. Hiking, trout fishing, fall foliage or skiing. 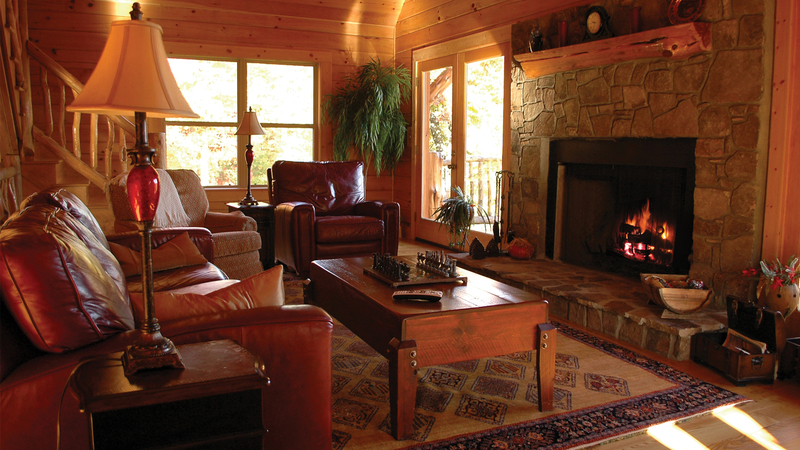 Rustic Elegance Abounds: Highrock Haven is a grand timber log home with spectacular views! 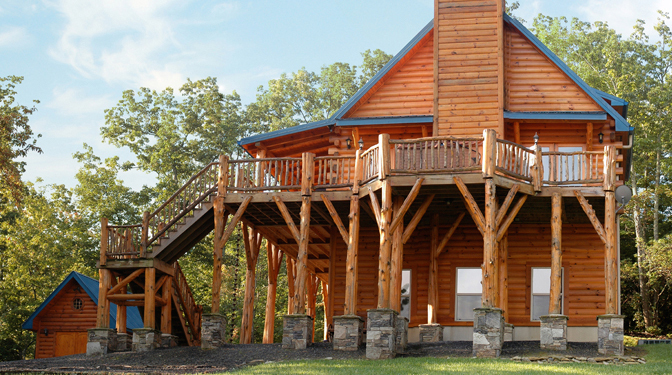 This 3-story log home in the mountains blends old-world craftsmanship, with modern convenience! 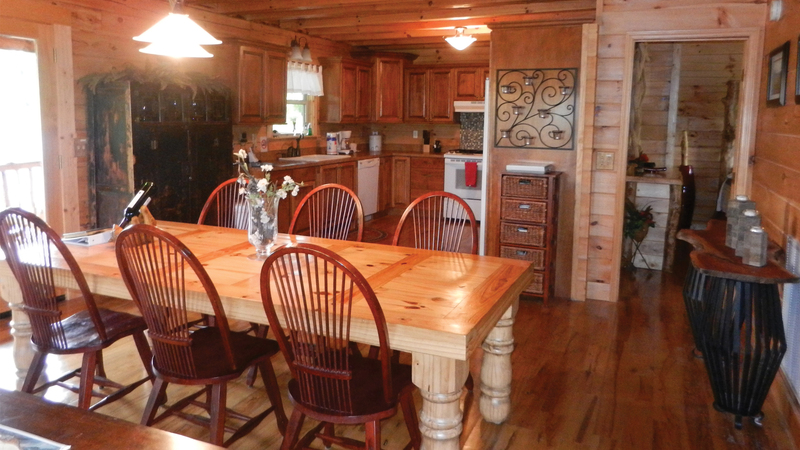 Cozy-up to the 52” wood burning fireplace or prepare a feast in the country kitchen. With four spacious bedrooms and three luxurious bathrooms, this home is a great place to have a gathering with family or friends. 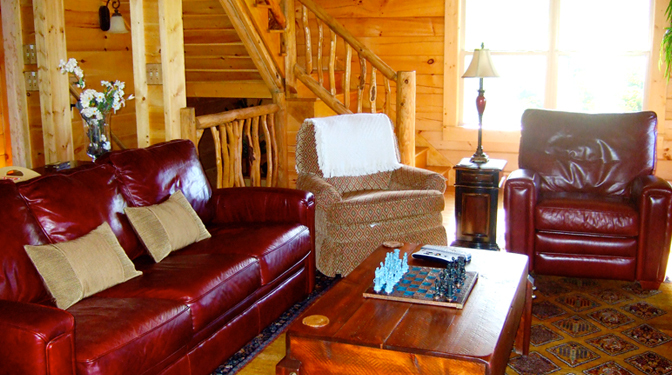 Richly decorated, the living room features a leather sleeper sofa with a matching rocker recliner, a plush upholstered chair, a beautiful stone fireplace, and a state of the art 42' wide screen LCD TV/DVD player and Direct TV and plenty of DVD's. 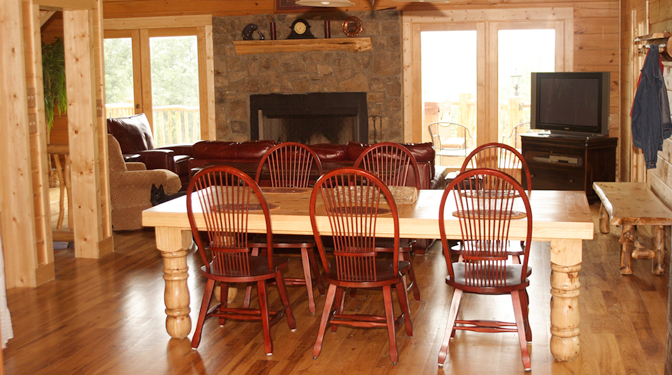 On the main level is the fully equipped kitchen, and the dining room area with a hand crafted pine table, custom made to comfortably seat 10 people. Enjoy the fun of 'grilling out' on the convenient gas grill, located on the spacious deck, overlooking gorgeous views. 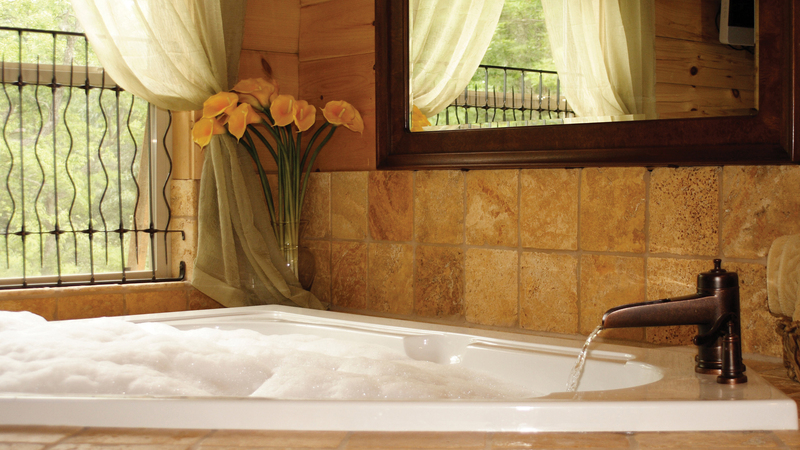 After dinner, enjoy a glass of wine while soaking up the stars in your 5-person hot tub. Your Home Away From Home. : The master suite, located on the loft level, features a king size bed, 36' flat screen TV, a stone jacuzzi tub, and a private bath with a shower and natural travertine tiles. 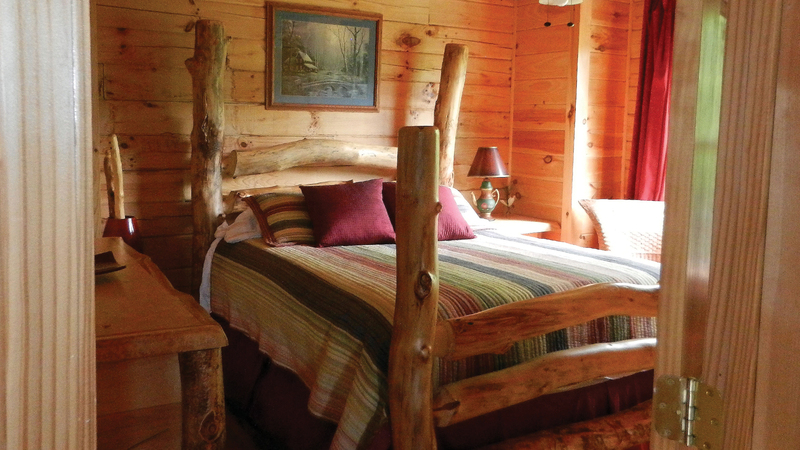 The Queen bedroom features a beautiful hand crafted aspen log bed and luxury linens, while the Twin bedroom features plush pillow-top mattresses that can be converted to a King Bed. 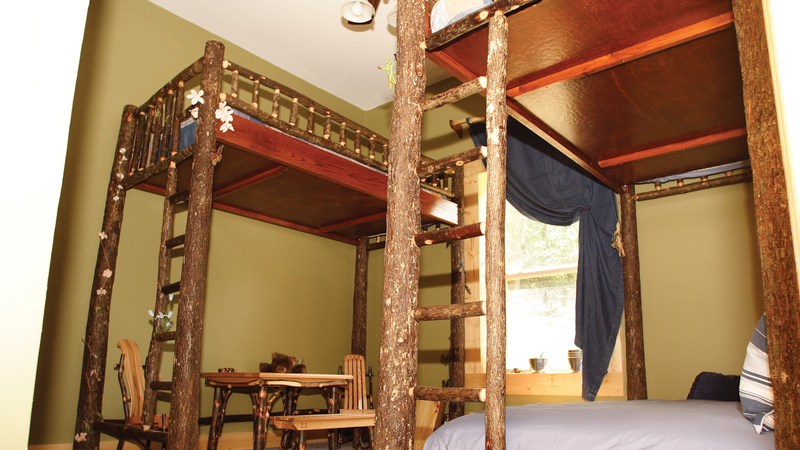 And lets not forget the kids - they get their very own forest inspired bedroom with hand-crafted Hickory loft beds and seating area, loaded with board games for family game night and over 100 DVD's to choose from the video library. Fun For All Ages. 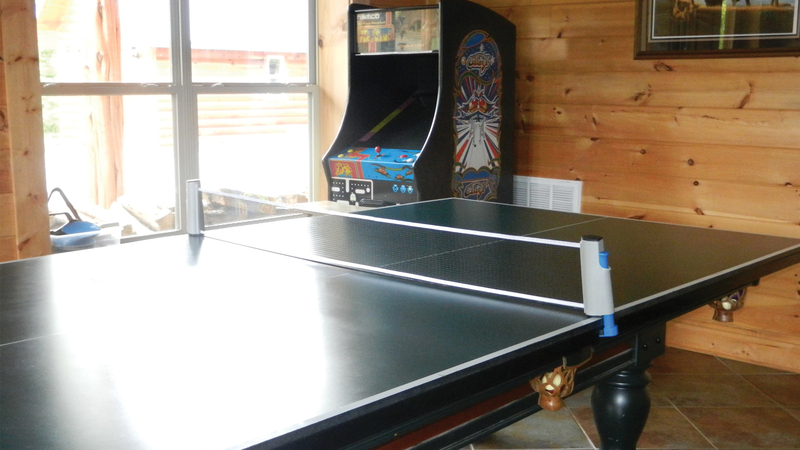 : Located on the lower level is a spacious game room which includes a full size pool table with conversion top for family ping-pong tournaments, 42” flat screen high-def TV, DVD/VCR player and DVD library! 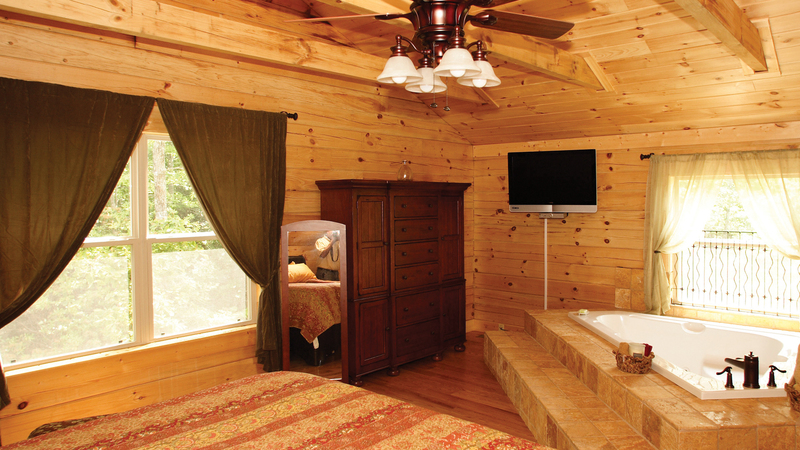 This room has been furnished with a comfortable full size sleeper sofa and upholstered chair. As beautiful as this home is, it's just a prelude to the many gifts outside your door. 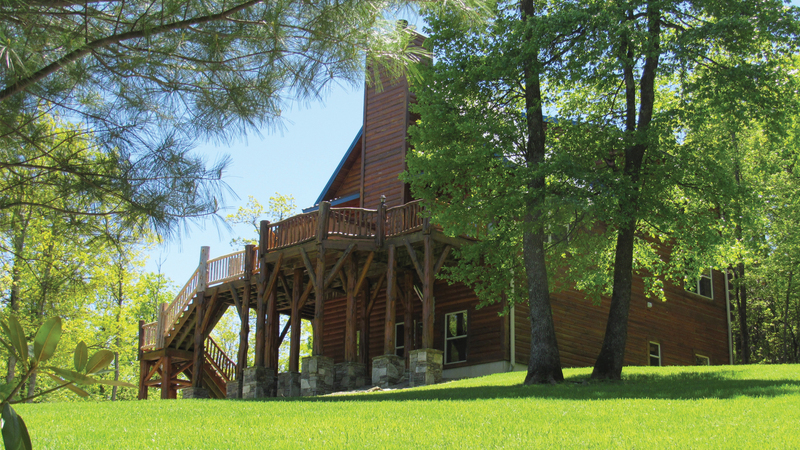 Hiking trails, cascading creek and pond are just right outside your front door! Enjoy making smores at the outside bonfire pit or the creek-side bonfire pit and catching tadpoles and salamanders in the creek. Or simply sit back and watch the hummingbirds, woodpeckers, squirrel, rabbit, and deer - just some of the neighbors that may visit. 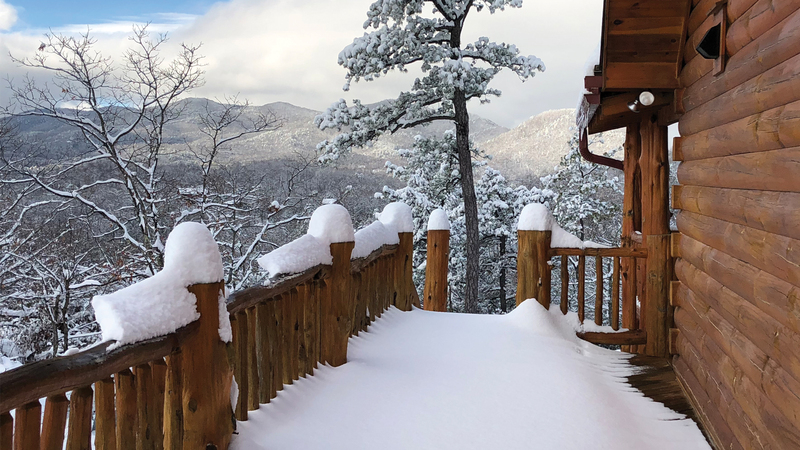 In each and every season, Western North Carolina offers some of the best vacation possibilities. 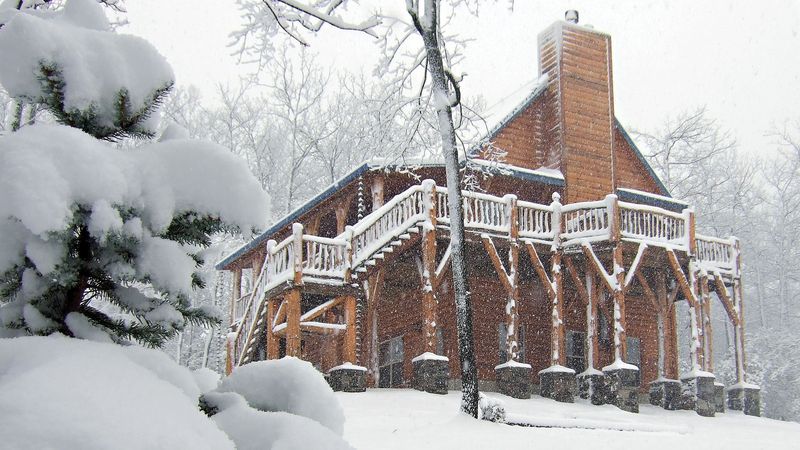 Spring hiking, summer trout fishing, fall foliage or winter skiing. Highrock Haven is centrally located so that you may enjoy local attractions like the popular Biltmore House - each of these with just a short drive. $50 PET FEE PER DOG FOR DOGS OVER 15 LBS. CHECK IN TIMES ARE ANYTME AFTER 4:00. 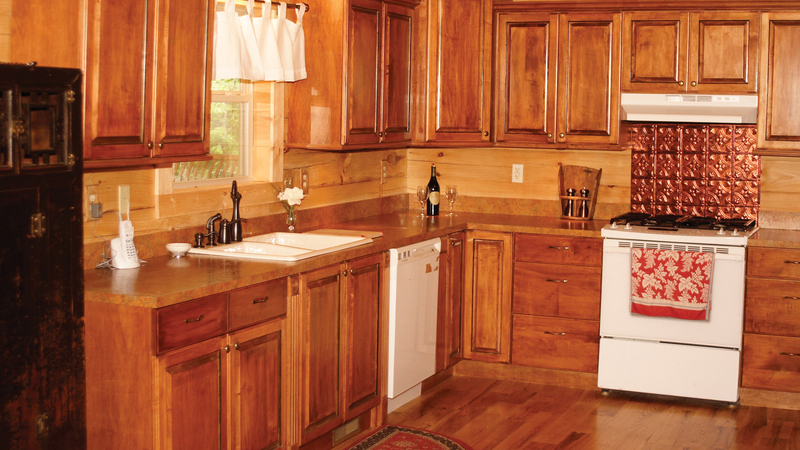 THERE WILL BE INSTRUCTIONS TO THE HOME IN THE GUEST BOOK ON THE KITCHEN TABLE UPON YOUR ARRIVAL. CHECK OUT TIME IS 10:00 AM. THERE IS A CHECK OUT LIST ON THE BACK PAGE OF THE GUEST BOOK, LOCATED ON THE KITHEN TABLE. SUMMER MONTHS, JULY 4TH WEEK, THANKSGIVING WEEK, CHRISTMAS WEEK, AND NEW YEARS WEEK RENT FROM A SAT TO SAT OR FROM A SUN TO SUN FOR 7 NIGHTS. ALL OTHER DATES RENT FOR A MINIMUM OF 3 NIGHTS UNLESS THERE ARE ONLY 2 NIGHTS REMAINING BETWEEN BOOKINGS. Cancellations by Tenant. In the event of a cancellation by the Tenant greater than 30 days before Rental Date, Tenant shall receive a refund of all payments made by Tenant, less an administration fee of $25.00. In the event of a cancellation by the Tenant 30 - 11 days before Rental Date, Tenant shall receive a refund of all payments made by Tenant, less 50% of Gross Rent. In the event of a cancellation by the Tenant 10 - 1 days before Rental Date, Tenant shall receive no refund of Rental Agreement Total. A SIGNED RENTAL AGREEMENT AND 50% OF RENTAL FEES DUE TO BOOK ANY DATES WITH THE REMAINING BALANCE DUE 30 DAYS BEFORE YOUR ARRIVAL DATE. $125 HOUSE CLEANING FEE AND A $50 PET FEE FOR DOGS OVER 15 LBS. Damage Deposits…..PLEASE DO NOT MOVE OR RE-ARRANGE ANY FURNITURE OR BEDS OR ANY TELEVISIONS OR UNPLUG ANY WIRES FROM THE TV'S, OTHERWISE THERE WILL BE A $200 FEE DEDUCTED FROM DAMAGE SECU-RITY DEPOSIT FOR RETURNING FURNITURE/TV'S AND OR TV WIRES TO ORIGINAL LOCATIONS….Tenant agrees to be responsible for any damages to the Premises during the period of tenancy, including damages to the furnishings and household items which result from the action or inaction of the Tenant, excluding, however, normal wear and tear. The amount of the damage deposit is specified on the top of this Agreement. The purpose of the damage deposit is to protect the dwelling/contents from mali-cious or negligent damages and/or dwelling being left abnormally dirty resulting in excessive cleaning cost (i.e. carpet/furniture stains, incomplete check out duties, etc.) It is the Tenant's responsibility to report to the Owner immediately upon arrival any dam-ages found and any repairs and/or maintenance needed. Failure to report any of the above mentioned items prior to check-out could result in full or partial loss of the damage deposit. In addition, Tenant agrees to reimburse Owner for any damage expenses incurred in excess of the damage deposit, including collection costs, if necessary, and reasonable attorneys' fees. 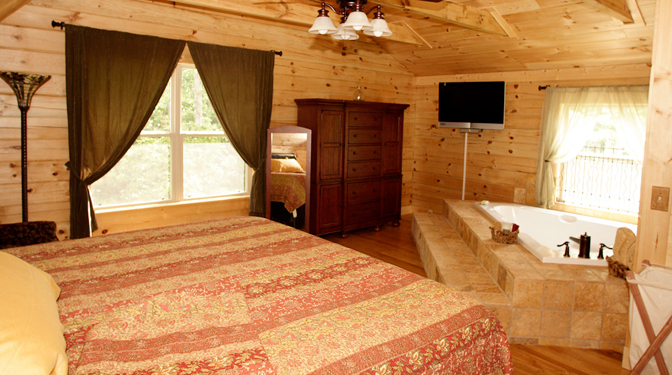 The cabins are carefully inspected after each rental. Damage deposits will be processed for return within 10 days after check-out. I've stayed at the High Rock cabins on multiple occasions, however, this was the best trip yet. My wife and girls arrived in Black Mountain two days after i did, just in time for a major snowstorm! My wife didn't have four-wheel drive, but the owners were kind enough to go into town with me to provide a ride up the mountain. The owners insisted that we use their sleds and they even provided extra amenities so we didn't have to travel back into town. As always, the cabins were in great shape, with everything we needed - full propane tanks for the grills, extra wood for the fireplace, and utensils for cooking, not to mention the Ms. Pac-Man machine! 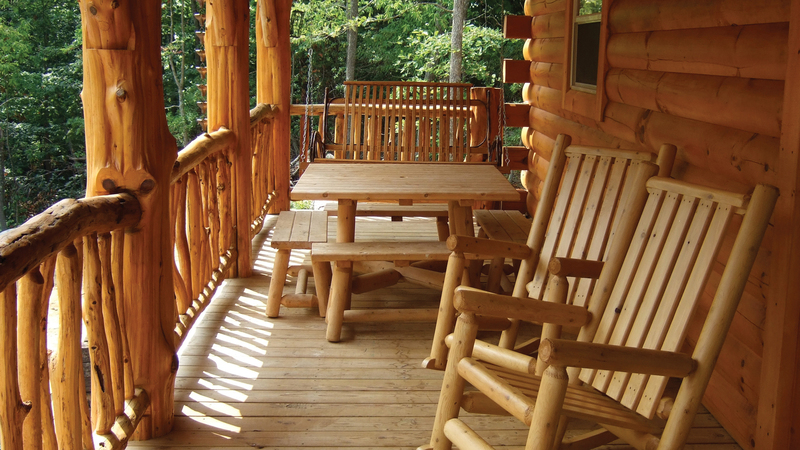 Bottom line - the owners of the High Rock cabins care about their guests. They go above and beyond to do whatever they can to make guest visits as fun and comfortable as possible. My family is already looking forward to the next trip to Black Mountain! This was our 2nd time in Black Mountain and with High Rock Rentals. The 1st time, we stayed in Hideaway. 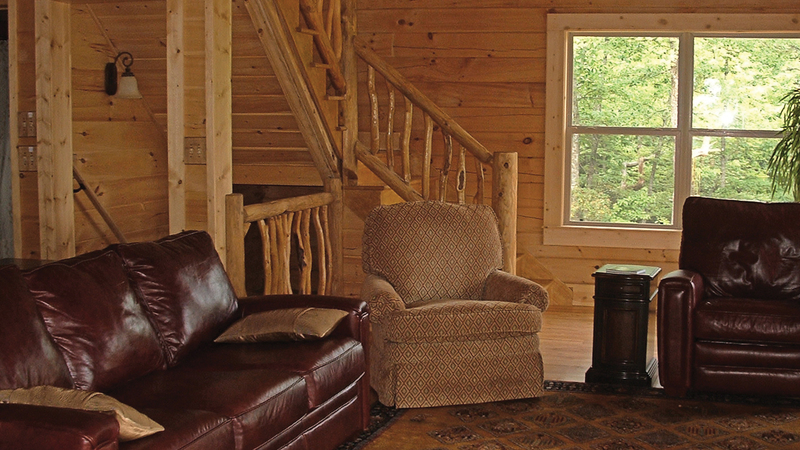 This time we stayed at the Highrock Haven cabin. The cabin was a perfect size for our two families to enjoy (total of 9 people for the majority of the stay plus a few others for a couple of nights). The town is very quaint and it's so close to Asheville, Lake Lure and Hendersonville with many outdoor things to do. It snowed during our stay (on New Year's Eve) so the kids really enjoyed playing in the snow and sledding/tubing right on the property (we also went tubing one day to an actual tubing hill - so fun!). I would definitely plan to stay again. Thank you High Rock Rentals and Mike for a great stay. We would love to come back again. This property is not only huge and perfectly kept, but has absolutely everything you need as a family to to make it a home away from home. All cooking stuff, big fridge, plenty of rooms, and the kids loved the video game and pool table downstairs-they left us alone for hours on end (they are 14-16 yrs old). The adults got quiet time on the main floor and outside balcony to talk and have coffee. Everyone got to enjoy the hot tub, and the sunsets were oh so lovely. Also- the owners were immediately available when we needed them. The front grass was a great little place for our little pooches. 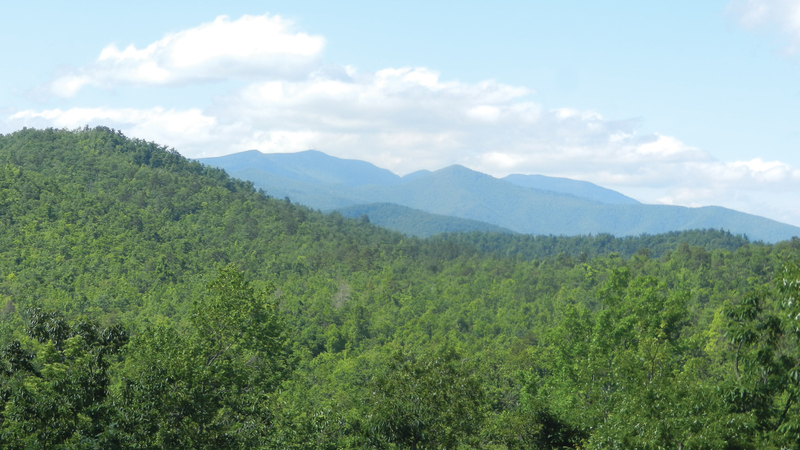 Both Black Mountain and Asheville are very close to go out for excursions, and we also did a white water rafting trip which was great and relaxing for the whole family. This house is at the tippy top of the mountain, and the entire family and dogs walked all the trails. If you love the mountains, you will love this. Would love to come back again. This was our second stay with Mike and Beverly Roseman. 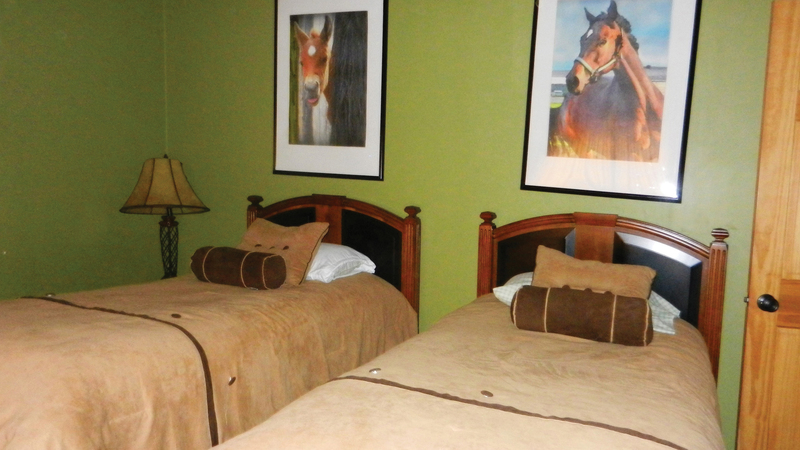 As with our first visit, they were very accommodating and everything was perfect. We wanted to get away for a relaxing, peaceful week of leaf viewing. Highrock Haven fit the bill perfectly. It was quiet, peaceful and the views are amazing. The home is well equipped and clean. 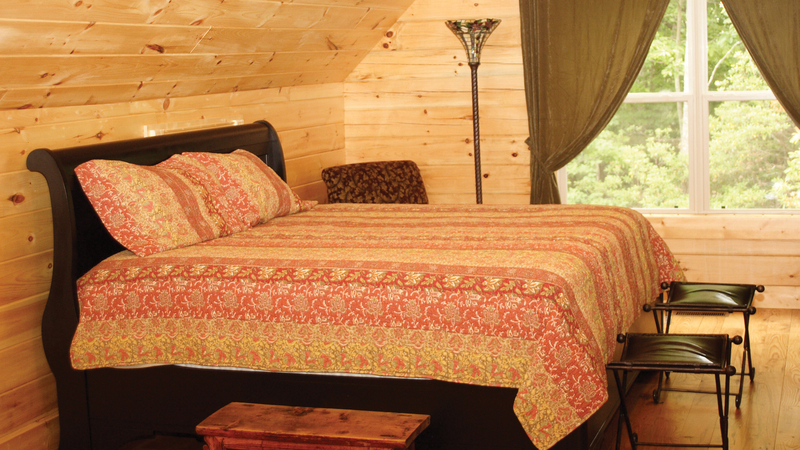 It is so inviting, you feel it is home away from home. The properties of High Rock are pet friendly. Our dog had a great time laying on the deck and exploring the surrounding property. Highrock Haven has a nice size yard for kids or pets to play. 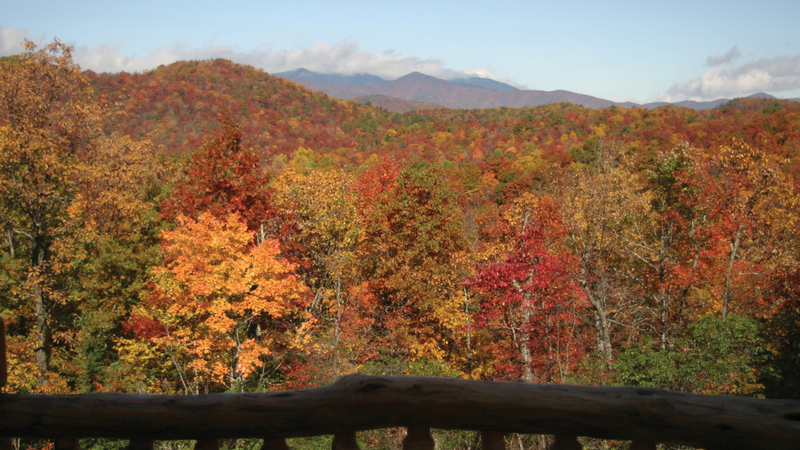 We spent most of our time on the Blue Ridge Parkway, and the fall foliage was spectacular. We went to Mt. Mitchell and also Mt. Pisgah. We took a lot of gorgeous pictures. We also went to the Folk Art Center, and as always I bought too many local crafts. I highly recommend Black Mountain and Highrock Haven to anyone who wants a fantastic mountain experience. We will definitely be back as soon as possible. Thanks for another great visit!